50’s noir detective vibes drip off the pages of The Electric Church, Jeff Somers’ riveting first novel and first entry in the saga of Avery Cates, gunner extraordinaire, and his struggle against The System. The scene above in Pickering’s gin-joint conjures up images of Bogart hunched over a bar as readily as Han blasting Greedo in the Mos Eisley Cantina. 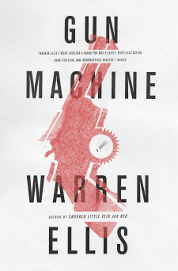 Mashing up flatfoot fiction with near-future dystopian sci-fi is bold move, so does he pull it off? First, let’s dial it back a notch. The date is a few decades from now following a global upheaval known as The Unification. That’s right, one-world government arrived and it was sure bloody. Rather than freeing the people from their shackles the result of the ultimate centralisation of power has been to turn the world in Escape From New York on a planetary scale. The 1% lucky enough to possess monetary wealth live decadent lives, lording it up in their high castles and occasionally donning filthy disguise for the thrill of slumming it with the poor. Of which there are many. The rules are simple in this world: you’re either rich, a cop or less than zero. For the latter, the 99%, life is brutish and short with lifespans over a few decades drawing admiration or disbelief. However you can always count on religion, Marx’s famed opiate, to prey on the desperate when times are dark. Enter The Electric Church, whose mission is to grant eternal life in this world to its followers – after all, even an eternity alive may not be enough to repent for our heinous sins. How exactly is this achieved? Simple – remove the brain and implant it in a cybernetic body, replete with sinister Auton-esque mask and unnecessarily violent attachments. These Electric Monks divide their time between proselytising on street corners and ushering the converted to their new existences, feared and mocked by the populace in equal doses yet protected by the ironclad religious protection act. If the set-up sounds equally insane and implausible then you’re absolutely correct and let me assure you – that’s part of the fun. 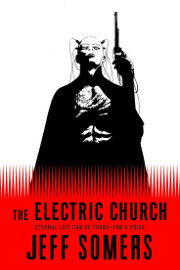 The Electric Church is an oil-burning page-turner playing like a pulp novel yet with a serious literary bent. Jeff Somers obviously spent some large portion of his life wolfing down Hammett, Chandler and their lesser-known ilk and portrays bustling, seedy dives and wandering, down-on-their-luck loners with a natural ease. Cates is such a grim, sardonic anti-hero that he often seems in danger of falling into caricature before saving himself with his stark insights into the rigged nature of the game he’s forced to play.The team of broken, conniving rejects he rounds up as his crack team and the decaying world they inhabit all contribute to the atmosphere of hopelessness which all must overcome. 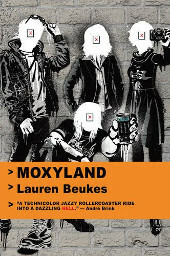 The Electric Monks themselves are a cornerstone of the novel. They’re what you would expect to come charging at you if William Gibson wrote an episode of Doctor Who; identikit automatons, serene on the surface but harbouring hidden power, endlessly repeating their insane litanies until they time comes to excavate your skull. A week after finishing The Electric Church I still find their frozen rictus grins lurking at the corner of my nightmares, their fearsomeness abated only by the deliciously snarky subtext that inside every religious drone was once a sane person, finally driven mad by the pressure of the nonsensical dogma pumped into their skulls. The People’s Republic of China, some time in the near future: the population, particularly in urban areas, is happier than ever. Despite a global economic recession China has flourished. Embracing the best of capitalism while avoiding its excess, the country has forged a new path for itself as the sole global superpower. The affluent and cultured middle classes discuss the latest works of literature in bustling coffee shops while the sounds of industry and creativity reverberate through the streets. These truly are the fat years, a golden age for a country reborn. Old Chen is a knowledgeable member of the intellectual elite, a respected author whose opinions on matters literary and political are sought and valued. Like the rest of the population he rarely questions just how this state of affairs popped into existence. Not until and old flame, Little Xi, suddenly re-materialises in his life to raise a niggling problem. Why is it that the nation seems to have collectively forgotten an entire month just prior to China’s phoenix-like ascendancy? A whole month gone, without mention and without trace, simply vanished into some communal memory sink. The discovery leads Chen to instigate a hunt for the truth, leading down all kinds of unfriendly alleys and even to kidnap of government officials. The truth behind The Fat Years must come out at all costs. His quest leaves no-one untouched, from prostitutes to politicians, academics to artists. Chen’s mission to uncover the truth becomes a driving obsession which inevitably throws up a deal of human turbulence in its wake. Sitting in Taiwan while writing this it is easy to sympathise with Chan KoonChung and what he is trying to achieve in The Fat Years. It’s impossible to live in China’s tiny southern neighbour, constantly under the watchful and militaristic eye of the harsh, authoritarian empire next door, without forming strong opinions on Chinese policies both international and domestic. Ever since Mao’s revolution the PRC has been famed for censorship of political ideas, draconian measures to prevent discord, Stalin-esque revision of history and attempts to hide the very existence of the outside world from its largely suffering populace. Indeed The Fat Years itself is banned in China, although something of an underground success among subversive groups and high society alike. To an outsider it can easily appear that the ranks of the Chinese rich, disconnected from their rural roots by an ever-widening wealth gap, have been brainwashed when it comes to how their success was achieved. Seemingly blind to their country’s political oppression, terrible human rights record, opposition to intellectual honesty and rejection of any notion of equality, they continue about their daily business oblivious to the world around them. Or do they? Is this true blindness or willful ignorance, a refusal to face unpleasant cognitive dissonance? And is it better to live such a comfortable yet fundamentally dishonest existence or to face the truth no matter how harsh it may be? This question lies at the core of The Fat Years and Chan answers it in no uncertain terms. Through a series of encounters – political, sexual, intellectual – he lays bare his contempt for those who seek to remain unaware of the world at large. He makes no attempt to sugar-coat the fact that the revelation of truth is unpleasant, tiring and thankless. You can expect no reward for following his path and dealing with life as it really is but it’s the only way to be true to yourself and to others. For my part I thoroughly enjoyed Chen’s journey and as a staunch opponent of China’s political system (did you guess?) I found myself supporting him every step of the way. The Fat Years is a book of wonderful ideas, the only problem being that some of them are lost in translation. As a student of Mandarin I appreciate how difficult it can be to transliterate from this complex and difficult language and make no mistake, Michael Duke does a wonderful job at times, eliciting some beautiful turns of phrase from his source material. Inevitable though, sometimes the flow of the prose falters and seems a little stilted. Serendipitously this can work in the book’s favour, generating a little unease at the perfect moment, but other times it can be distracting. 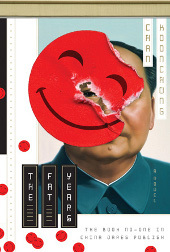 That minor gripe aside, The Fat Years is a book to be savoured by any residents of this part of the world, those with an interest in eastern politics or simply anyone with a hankering after a dystopian tale with a different background.